Virat Kohli is handed the ICC mace by Sunil Gavaskar and Graeme Pollock, former batting greats, for being the No 1 Test side in the world. Bhuvneshwar Kumar is the Man of the Series! "First of all thanks to IPL which makes every bowler a thinking bowler. You've to think each and every ballIt's very important to not give away too much in the first six overs. I always try to keep it simple, knuckle ball and bouncer comes into play. Enjoyed the whole tour, especially Test matches," says Bhuvi! "Kohli's got a stiff back, he's had a long season So he misses out," says stand-in India captain Rohit Sharma. Kohli misses out for India in their last match of the tour, and Dinesh Karthik is his replacement. The other changes are Bumrah coming back in place of Unadkat, and Axar replacing Chahal. "It's been a formula that's worked for us, so it's going to be the same," says SA captain JP Duminy at the toss. SA XI: David Miller, Reeza Hendricks, JP Duminy (c), Heinrich Klaasen (wk), Farhaan Behardien, Christiaan Jonker, Andile Phehlukwayo, Aaron Phangiso, Chris Morris, Junior Dala, Tabraiz Shamsi. Two changes for the Proteas — Christiaan Jonker comes in place of JJ Smuts, with Miller set to open, while Aaron Phangiso replaces pacer Dane Paterson. TOSS: South Africa win the toss for the third time in the series, and captain JP Duminy opts to field once again! It's Rohit Sharma, and not Virat Kohli, who walks out to the toss instead of Virat Kohli. That's it from us at Firstpost as we come to the end of the marathon tour of South Africa. It was a great learning curve for the Indians, as they fell short in the first two matches of the three-Test series despite putting in a great effort, before bouncing back in style to not only win the Wanderer's Test, but bag the ODI and T20I series 5-1 and 2-1 respectively! Was fitting for the series to end in such a thrilling manner, with debutant Christiaan Jonker nearly guiding the Proteas home in a late burst, while falling short of what would've been a dream half-century on debut by just one run. On that note, it is time for me, Amit, to sign off as we mark the end of our coverage for this tour. We certainly look forward to catching our breaths in the break that follows before the 'Men in Blue' return to action in the T20I Tri-Series in Sri Lanka. For now, I bid you good night on behalf of my colleague Devdutt, as well as our statistician Umang Pabari and freelance cricket writer Chetan Narula, who provided us with valuable inputs from ground zero. Virat Kohli: Having received it twice in a row is something very very special. To be able to maintain your performances is very pleasing at the international level. Full credit to the support staff as well as the boys. We are in a very exciting position at the moment. (On learning in South Africa tour) We understood the cricket that we need to play overseas, as well as the mindset that one needs for such a tour. That is something that we'll take back home. We take a lot of learning back home as a Test team. I would say we are still 80 percent. We haven't been able to play as we would've like. We certainly don't feel we are 100 percent yet. To be a world-class side for a long period of time, you need to be at your 95-100 percent everywhere you play. Rohit Sharma, India's stand-in captain: To be honest, I thought we were 15 runs short. How the first half went, I thought we lost our way towards the end. I mean these things happen and we learn from it. It was a decent score and once again, the bowlers did it for us. Hopefully we can move forward as a group in the coming games. We discussed certain plans and it worked. We tried to keep the ball on the stumps. It was a complete bowling unit performance. Suresh Raina is the Man of the Match. He scored 43 runs and took a wicket. Raina: You need to show intent in the first 6 overs. Credit to Kohli and Shastri for giving me the freedom. (On his first-ball six) When you get the ball in your area, you hit it. What we've done in the last one and a half months, no team has done in years. Credit goes to the support staff, who gave us a lot of confidence to express ourselves. JP Duminy, South African captain: They bowled pretty well in our batting powerplay. We couldn't get boundaries, and when we got boundaries, we couldn't get the singles either. Definitely thought 170 was gettable. Gotta give them credit for the way they executed their plans. I'm really proud of the way the guys went, especially Jonker in his first game. Full credit to India. Outstanding white-ball tour. First two Tests was good for us, and then winning the third Test gave them a lot of confidence. This is India's eighth consecutive bilateral T20I series win of three or more matches. They have not lost any till day. Bhuvneshwar Kumar took seven wickets in this series - the most by an Indian pacer in a bilateral T20I series. Bhuvneshwar bowls the final over. Jonker can only collect a single off the first ball, smacking it towards sweeper cover. Behardien uppercuts a short, wide ball over short third man for a four. Single collected off the third ball, with an under-pressure Bhuvneshwar conceding a wide off the fourth. Jonker squeezes a full toss down the ground for a couple of runs. Two off the fifth delivery, with Jonker squeezing a full delivery towards square-leg for a double. Full toss off the last ball, with Jonker getting a leading edge to get caught by Rohit at extra cover. India win by 7 runs to win the three-T20I series 2-1. That's two trophies to India out of three in this tour. It's all over... with a ball to spare... Bhuvi has held his line... 8 to win off 1... surely the most reliable Indian pacer can mess this up!! FOUR! Short and wide from Bhuvneshwar, and Behardien cuts this one over short third man! SA 159/5, need another 14 from four balls. Bhuvneshwar returns to the attack to bowl the final over. For a change, both batsmen as well as bowler are under pressure now. Jonker is seriously quick between the wickets... some running that. Are South Africa, nay, is he turning this game? South Africa need 19 off the last over, with debutant Jonker on strike. Behardien smacks a full toss along the leg stump towards the backward square-leg fence off the first ball. Two balls later, we have Jonker smashing the ball over the long on fence for his second six. Two quick doubles collected off the next two deliveries, with the 150 coming up for the Proteas. Single collected off the last ball. 16 off Bumrah's final over. South Africa still have a slim chance. 18 off that last over... Jonker making a mark on T20 debut. Pretty ordinary from Thakur that over. More work for Bumrah to do. South Africa need 35 off the last 12 balls. Huge over for the Proteas, although one wonders if it arrived a tad to late for them. 18 collected off it, with Jonker smashing a six and three fours off it to race away to 33. Whether he guides the Proteas home today or not, he certainly would've impressed the national selectors on international debut. South Africa need 53 off the last 3 overs — a near-impossible equation for the Proteas now. Bumrah starts his third over off with a wide, with Morris getting off the mark with a thick edge that sends the ball running away to the third man fence. Morris however, is castled off the third delivery, getting his middle stump uprooted. Behardien gets off the mark with a single off the first ball that he faces, before smacking the ball down the ground for a four two balls later. Bowled him and jumps... Bumrah making a difference again in this game! Thakur returns to the attack, with Duminy and Jonker exchanging singles off the first two deliveries before the captain decides to change his bat. Gets a boundary off the third delivery, which brings up his 11th T20I fifty. Goes for a double off the penultimate ball, before perishing off the last delivery, getting caught by Rohit near extra-cover. Eight runs and a wicket off it. And Duminy is gone... the main batsman is gone... he needed to finish this game for South Africa, set batsman is very valuable on this pitch.... but he is gone now. The game turns in India's favour... they are in the driving seat now. JP Duminy becomes the fourth captain to score two fifty-plus scores in a bilateral T20I series after Kumar Sangakkara, Mohammad Hafeez and Kane Williamson. South Africa have to go after everything now... Duminy marshalling the innings but this is getting beyond his reach too... Two big overs needed... atleast one and a half! Thakur back into the attack in the 16th over of the innings. SA need 72 off the last 30 balls. Bumrah returns to the attack in the 15th over of the innings. Jonker gets a single off the first ball, with Duminy smashing his second six two balls later, with the ball sailing over the long on boundary. Singles collected off the next two balls, with the 100 coming up for the Proteas. Duminy keeps the strike with a single off the last ball. 10 off the over. Jasprit Bumrah returns to the attack in the 15th over of the innings. Raina returns to the attack. "13.5 chahiye" yells Dhoni to his CSK teammate, talking about the required run rate. Debutant Jonker gets off the mark with a double off the third delivery, before collecting back-to-back fours. Collects a single off the last delivery to keep the strike. 12 off the over. India vs South Africa, 3rd T20I in Cape Town, latest update: Bhuvneshwar bowls the final over. Jonker can only collect a single off the first ball, smacking it towards sweeper cover. Behardien uppercuts a short, wide ball over short third man for a four. Single collected off the third ball, with an under-pressure Bhuvneshwar conceding a wide off the fourth. Jonker squeezes a full toss down the ground for a couple of runs. Two off the fifth delivery, with Jonker squeezing a full delivery towards square-leg for a double. Full toss off the last ball, with Jonker getting a leading edge to get caught by Rohit at extra cover. Preview: India and South Africa will battle it out in the series-deciding third and final Twenty20 International (T20I) at the Newlands Stadium here on Saturday. In the first game, a brilliant all-round show helped visitors beat hosts South Africa by 28 runs at Johannesburg. In the second game, South Africa, who lost the One-Day International (ODI) series 1-5, kept the T20I series alive by registering a six-wicket victory at Centurion. The second match was a show of respective batting resolves by both sides, especially of their middle-order batsmen. 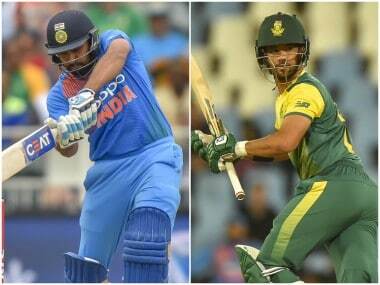 While Manish Pandey (79 not out off 48) and Mahendra Singh Dhoni (52 not out off 28) responded for India, the hosts had to thank Heinrich Klaasen (69 off 30) and Jean-Paul Duminy (64 not out off 40) as they overhauled the visitors' total of 189/4 with six wickets and 1.2 overs to spare. 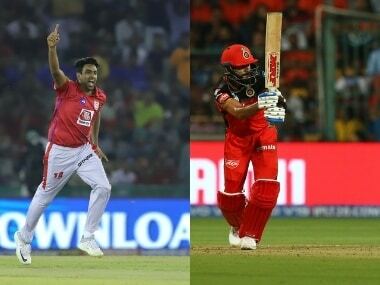 Klassen and Duminy were particularly harsh on leg-spinner Yuzvender Chahal (0/64) and left-arm medium pacer Jaydev Unadkat (2/42) in the second match. 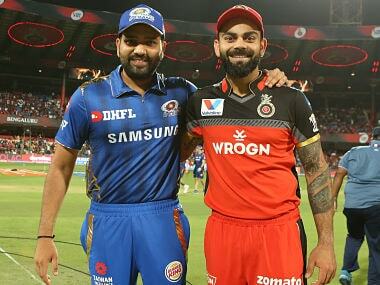 These two will be eager to bounce back with improved performances in the third match as captain Virat Kohli trusts them. Kohli will depend on seamers Bhuvneshwar Kumar, if he is not rested, to provide the early breakthroughs. It is though not clear whether Kohli prefers to rest Bhuvneshwar, the way the team rested fellow pacer Jasprit Bumrah in the second match. Bhuvneshwar has played a lot in the tour which comes to end with the match on Saturday. The place of pacer Shardul Thakur is not guaranteed as the Mumbai right-armer has not impressed much in the two matches. The match may see the return of chinaman spinner Kuldeep Yadav. In the batting department, alongside skipper Kohli, batsmen Rohit Sharma, Dhawan, Dhoni, Hardik Pandya and Pandey will look to make the most of their capabilities this time also. Batsman Suresh Raina, who made a comeback in the T20Is will act as a vital cog in the middle-order and will look to proving his mettle after scoring 46 runs in two games. The home camp will be high on confidence after ending their three-match losing streak across ODIs and the first T20I. They must have been relieved the way they dealt with Chahal, who tormented them in the ODIs. While Reeza Hendricks punished the Indian spinners in the opener, Klassen and captain Duminy did the job in the second game. Farhaan Behardien and David Miller have not lived up to the expectations yet and the match gives them another chance to make impact and impress the selectors ahead of the busy schedule. The bowling department, featuring Andile Phehlukwayo, Junior Dala, Dane Paterson and Chris Morris along with chinaman Tabraiz Shamsi will have to come up with something special in order to get rid of the flamboyant Indian batsmen. India squad: Virat Kohli (captain), Rohit Sharma, Shikhar Dhawan, Lokesh Rahul, Suresh Raina, Mahendra Singh Dhoni (wk), Dinesh Karthik, Hardik Pandya, Manish Pandey, Axar Patel, Yuzvendra Chahal, Kuldeep Yadav, Bhuvneshwar Kumar, Jasprit Bumrah, Jaydev Unadkat, Shardul Thakur. South Africa squad: Jean-Paul Duminy (captain), Farhaan Behardien, Junior Dala, AB de Villiers, Reeza Hendricks, Christiaan Jonker, Heinrich Klaasen (wk), David Miller, Chris Morris, Dane Paterson, Aaron Phangiso, Andile Phehlukwayo, Tabraiz Shamsi, Jon-Jon Smuts.